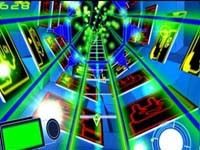 Frequency is a super-slick dance music title for the PS2 from SCEA and Harmonix with a surprising amount of depth to it. The sheer sophistication, coolness and interactivity in the title separate Frequency from the pack. The selection of underground dance music features top-names and is more interesting and varied than the generic tunes in most games. 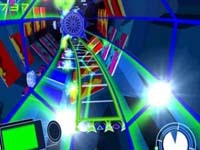 The gameplay is unique, interesting and also quite a bit more challenging than expected, and allows players to customize and remix tracks as well. If you love this kind of music, Frequency is an extremely cool title which also teaches you something about the art and techniques of remixing dance music tracks on the side. It does a highly-effective job on both entertaining and educating the player so it should not be missed. You start by selecting which track you want to build. The tracks are built by catching notes as they stream down a series of glowing cybernetic tubes that are arranged like a futuristic spider web. Each section represents a different element of the track such as bass, drums, synths, vocals and more. When you complete that section, that element is built on top of the base track until you unlock the full song. You need to catch a full two bars of music before that section of the track is finished. Once you successfully clear one element of the track, you rotate the web and move on to the next section. Each track is divided into 12 levels, and each one only has a few instruments to beat, with the other areas being blanked out, the trick is to rotate the tracks quickly enough to reach the next section to chain these together for combos. Each section of the track is given a different point value depending on the difficulty, and you can multiply the number of points by chaining together consecutive tracks. If you mess-up in a section, you lose the momentum of your multiplier and also some energy, this is important because the game ends when your power-bar reaches zero. Luckily, you have a lot more leeway early on which helps you get the hang of things but, later levels don’t allow for many mistakes. This is all done in a way that seems intuitive and the interface is both cutting-edge and simple, making things very easy to understand. The gameplay seems odd, but it makes perfect sense in the context, and the idea of a futuristic, cyber-remix console sets the game apart, giving Frequency a super-slick futuristic vibe that ties in perfectly with its forward-looking, progressive soundtrack. It’s very simple to understand but there are two other types of sections that appear during each track at random. These are special tracks which can help power-up your game. There are auto-capture bars which when collected and implemented, can be used to give you a free pass in any bar when you set it off. The other type of special is called a Multiplier which adds to the number of points you receive when you finish a level. These add some excitement to Frequency’s gameplay mechanics, making it seem more like a video game and less like a simulation. The way the game is set up immerses you in the world, allowing you to feel like you’re completely in control of the remix decks, while also allowing for plenty of thumb-blistering action. What’s also cool about Frequency is that the tracks are broken into their elements makes you feel like you’re more in control and make playing Frequency involve more than the usual “Simon-says” gameplay where you’re basically just clapping along. Since players are allowed to create their own identity and icon, you feel more involved in the action and its this interactivity that makes Frequency so much fun. What really makes the game cool is the music selection. Instead of going with boring uninspired techno from generic production houses, the producers have liscensed tracks from several high-profile acts. These are all excellent musicians and include BT, Paul Oakenfold, The Crystal Method, Lo-Fidelity All-Stars, DJ QBert, Roni Size Reprezent, Fear Factor and Orbital. This makes all the difference, since all the tracks included in the game are excellent and lend the artists give Frequency a rare credibility in the genre. What’s also cool is that players have the opportunity to remix these tracks once they put them together and can also save them, creating a truly interactive title. While learning how to remix the tracks is a bit complicated, it allows a lot of flexibility that allows you to leave your own distinct mark on each track. Adding to the intensity and action of the game are the beautiful and surreal, rave-flyer style graphics, which pulsate and move in time to the music, creating a hallucinatory feel that permeates the entire experience and makes the game incredibly intense throughout. Small touches are visible throughout that add more to the experience such as the band icons spinning around in each level. What’s even cooler about this is that there are several types of backdrops you can select from and there are eight available in all to keep things fresh throughout the game. The interface is slick as well, with stylish menus and a cool in-game icon system that utilizes the PS2’s particle effects to effectively rewards “FreQs” with cool visuals as they complete sections of tracks successfully. In addition to the music, there are also excellent sound effects and robotic voice-overs to add to the overall flavor of Frequency. The game seems very simple initially but becomes more complex as you move up to the later levels. This makes the game very difficult and you’ll need almost flawless timing and a perfect sense of rhythm if you are to have any chance at these later levels. You have little room for error as you move on, and the tracks become increasingly complicated with more difficult note positions and less time to react between them as well. It’s not that the game is impossible, but you will need to practice intensely and become intimately familiar with each track’s elements in order to beat these. At the end of each level, you can unlock a hidden song if you reach a certain level. There are 3 levels of difficulty in the game, easy normal and hard. While each one is substantially harder than the previous one, playing the more difficult levels unlocks entire levels of 5 songs each that aren’t available at the lower difficulty ranges. The reward you get for your efforts are a bevy of extra tracks to master and remix which adds even more depth to the game, but the time investment required to access these tracks is substantial. As stated earlier, Frequency isn’t as easy as it sounds, the complicated arrangements makes for a challenging game that will require both exceptional rhythmic and reflexive skills, contrary to what you might expect. Far from pandering to the lowest common denometer, Frequency asks a lot of the player and yet is also quite rewarding in its own right. It sets up different expectations than most games out there, yet what’s so unique about it may also be why it turns off so many players. While it’s not an easy task, especially in the intense later levels, it’s more than worth the effort since it’s probably one of the coolest ways to learn about the mechanics and compositional elements of dance music outside of traditional music education or a dry seminar. While it won’t turn you into a DJ overnight, it will give you an excellent sense of how tracks are taken apart and reassembled in new ways, possibly giving even a casual music fan a stronger appreciation of how difficult, yet interesting the process of remixing can be. This is not a game for everyone, but if you have patience and an open mind, this is sure to make for an exciting, if daunting experience. Exploring the world of Frequency uncovers a unique experience unlike any other in gaming to date, with more sophistication than one would expect. This isn’t a pure music production title, like MTV Music Generator, but the excellent mix of action and musical sophistication strikes a good balance which should both educate and entertain. There have been other attempts at this type of game, but none has pulled it off as successfully, or with as much style and coolness as Frequency has. This might be considered a niche title by some, but one that should not be overlooked because the overall polish and sophistication makes it both a lot of fun and stimulating at the same time.